It's going to be a busy day. Let's get straight to it. 1. Center stage for central banks: All eyes are on the European Central Bank. It will release its latest monetary policy decisions at 7:45 a.m. ET before President Mario Draghi's regular news conference at 8.30 a.m.
Draghi indicated recently that the ECB could launch a Fed-style quantitative easing program soon to support Europe's stagnating economy and fend off deflation. Many economists say the announcement won't come Thursday, but the central bank could take other steps such as a symbolic cut to record low interest rates or a limited program to buy asset-backed securities. The Bank of England kept its interest rates unchanged, as did the Bank of Japan. 2. Stocks lack enthusiasm: U.S. stock futures were barely budging from their Wednesday closing levels as investors wait for more details from the ECB. Any big moves in Europe could reverberate across global markets. European markets were looking weak in early trading and Asian markets mostly closed in the red. The previous session in the U.S. was relatively uninspiring. U.S. stocks were mixed as investors realized that a Ukraine-Russia ceasefire may still be far off. The Nasdaq lost about 0.6% and the S&P 500 slid by 0.8%. But the Dow gained nearly 11 points. 3. Mobile handset makers: Motorola (MSI) is holding a press conference in Chicago Thursday where it's widely expected to unveil a Moto 360 smartwatch ahead of Apple's iWatch. Shares in Apple (AAPL) were declining by about 1% in premarket, after dropping by 4.2% over the previous session. Some investors appear to be nervous that the expected launch of its newest iPhone on September 9 could disappoint. 4. Fast food fears: Get ready for shares in Yum! Brands (YUM) to take a dive when markets open. The stock fell by as much as 4% in extended trading after the company, which owns KFC and Pizza Hut, said it expects a 13% drop in same-store quarterly sales. It blamed one of its suppliers in China that was found to be using tainted and expired meat. Meanwhile, Yum Brands and other chains including McDonald's (MCD) and Burger King (BKW) will be dealing with worker protests Thursday across the U.S. This action is the latest in a two-year effort to get employers to pay workers a minimum wage of $15 an hour and allow them to form unions without retaliation. 5. 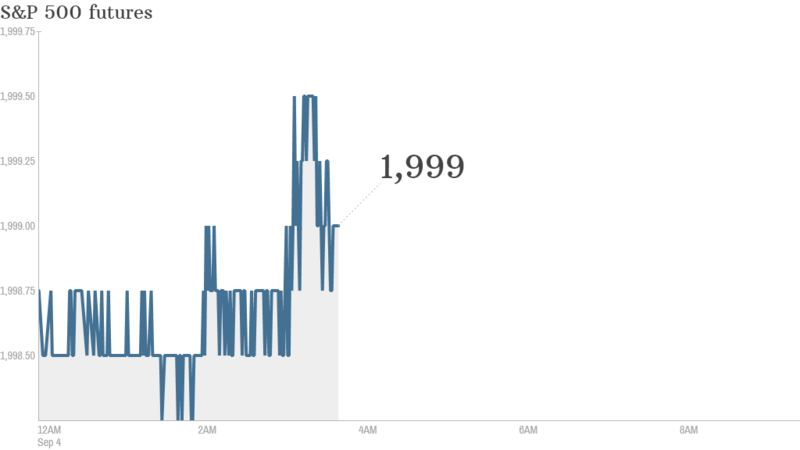 Economics: The U.S. government will report weekly jobless claims at 8:30 a.m. ET. ADP will release its monthly employment report at 8:15 a.m. ET.